December 20, 2015, 9:07 PM · Musicians and musical organizations around the world are mourning the death of Kurt Masur, conductor emeritus of the New York Philharmonic and former Kapellmeister of the Leipzig Gewandhaus Orchestra. Masur, 88, died Saturday in Greenwich, Conn. from complications of Parkinson's Disease. Born in Brieg, Silesia (now Brzeg, Poland), Masur studied piano, composition and conducting at the Music College of Leipzig. He was Kapellmeister of the Gewandhaus from 1970 to 1996, during which time he presided over the building of a new concert hall, completed in 1981. The hall would later serve as a place for diplomatic talks, at Masur's invitation, when pro-democracy and communist forces clashed in the days preceding Germany's 1990 reunification. As Music Director of the New York Philharmonic from 1991 to 2002, he is credited with revitalizing the orchestra and its reputation. Known as an expert in the works of the orchestral canon, Masur's tenure also saw the New York Phil commission more than 40 new works. Masur also served as principal conductor of the London Philharmonic from 2000 to 2007, and music director at the Orchestre National de France from 2002 to 2008. As a result of a childhood tendon injury, Masur always conducted without a baton. German violinist Anne Sophie Mutter: "I want you all to join me in a moment of silence, a moment of remembrance for one of the world‘s greatest musical leaders – Kurt Masur. My wonderful friend and collaborator of over 35 years passed away in the night of December the 19th. Kurt Masur stands for music in Schiller‘s philosophy expressed in his "ode to joy". His love for people, the moral and humanistic dimension of his life in thought as well as in conduct will be deeply missed around the world. I have lost a most noble and faithful friend to myself as well as to my children.The world – my life, will have less exuberance of expressiveness without you, dear Kurt." Russian-American violinist Philippe Quint: "RIP legendary Maestro Masur with whom I had the honor of performing my very first Korngold Concerto..."
U.K. violinist Tasmin Little: "Very sad to hear that Kurt Masur has passed away this morning... I have some wonderful memories of making music with him, as well as attending concerts and his fantastic recordings... After having worked together with the Royal Philharmonic Orchestra in the UK, he invited me to go to Leipzig to give the Leipzig premiere of the Delius violin concerto together at the Gewandhaus. This was in 1986. I went through Checkpoint Charlie - an unforgettable experience - before being taken to Leipzig in a very old car. Once in Leipzig, I was treated like royalty and although I was paid in "funny money" which I could not take out of the country, I would not have missed this experience for the world." 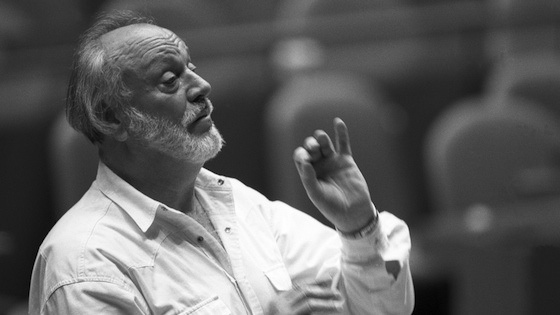 The New York Philharmonic: "The New York Philharmonic deeply mourns the loss of our inspiring and dedicated Music Director Emeritus Kurt Masur....Maestro Masur’s dedication to expressing humanism through music was most vivid in the wake of 9/11, when he led the Philharmonic in a moving performance of Brahms’s Ein deutsches Requiem, and musicians from the Orchestra gave free chamber concerts around Ground Zero. " New York Times: (Over his tenure as Music Director of the NY Phil), "Mr. Masur would bring to the Philharmonic a restored musical vigor; new recording contracts and regular radio exposure; a populist approach that helped expand its graying, rarefied audience; and a determination to improve the dubious acoustics of Avery Fisher Hall, its longtime home....He also brought to the podium the ardent conviction that music-making was a moral act that could heal the world. It was a belief he had put into spectacular public practice in 1989, when Communism in East Germany began to crumble and he used his singular renown there to avert bloodshed. Mr. Masur would put it into practice again, memorably and movingly, in a New York ravaged by the attacks of Sept. 11, 2001." National Public Radio: Quoting New York Philharmonic Concertmaster Glenn Dicterow, from 2012: "It takes a big personality to unite 105 players onstage — to get everybody to be as inspired as he is — and, uh, it's hard work. And he's just so demanding and intense that I think that he got, just by his sheer intensity of his personality, I think it sort of transformed most of us." 2013 Paris Interview with Norman Lebrecht: Masur, on encouraging someone to be a conductor: "...there is no reason for anybody in the world not to listen to classical music...it's a message of humankind, it's a message for every religion:... we want to be good human beings, we want to help our neighbors...then you have a profession that you think, if you die, maybe your life made sense." BELOW: Kurt Masur conducts Symphony No. 2 by Johannes Brahms, at a 2009 concert called, "20 Years Peaceful Revolution – Leipzig commemorates the 9th of October 1989"